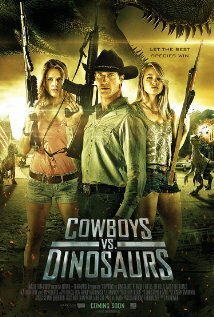 On this podcast Kevin covers Cowboys vs Dinosaurs (2015). After a mining explosion formerly believed extinct breeds of dinosaurs suddenly emerge from the rubble. Now, a disgraced cowboy, who recently returned home to make amends for his past wrongdoings towards his ex-girlfriend, must team up with her new boyfriend, the sheriff, to defend their town against the rampaging beasts. With the help of a few local gunslingers, the posse must band together in order to survive the deadly attack and take back their town.